Vinyl Banners & Fabric Backdrop Printing. Banner Printing. 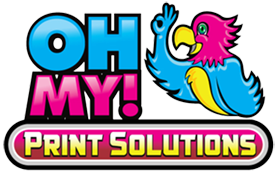 Oh my Print Solutions can have almost dozens of printing materials and processes to choose from. Hence, the most popular being Vinyl Banners, Fabric Backdrops, Mesh Banner Printing, and Large Format Canvas Prints. We also provide substrates available for outdoor banners, single or double-sided. Furthermore, backlit Vinyl Banners, Backlit Film, and UV protected. Banner Printing. And remember…..unlimited grommets, hemming, glueing and sewing are always free.